Somewhat related to another question, this one seeks more specifics on travelling from Roma Termini to Colosseo. I will arrive at FCO on the 10th of Aug and will be taking the Leonardo express to get to Roma Termini. I need to get to the Colosseum and I have been told to take the "Metro Line B" to the Colosseo from Termini. However, are there two different portions of the Termini station? Google maps shows that I have to change stations or something like that at TERMINI to get to Colosseo. What am I missing? 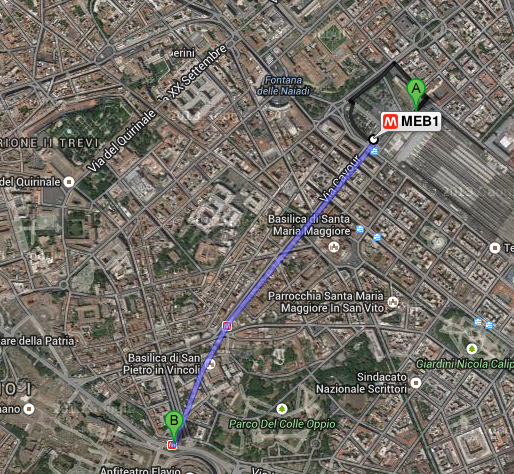 In the picture below, (A) is Termini and theres a black line that I must walk to get to... Termini? Long-distance and suburban trains terminate at the Roman Termini train station. From the train station, you need to change to the Metro station. Metro trains run undergound on dedicated tracks. When you disembark the train, follow the white-on-red M signs towards the Metro station. In the Metro station, you'll find ticket vending machines, then fare gates where you insert your ticket and go through. Be sure to take the correct line (line B, with blue signs) in the right direction (southwards towards Laurentina). The path going via the streets on Google Maps is due to their automated processing not being very smart. They've recorded the address of the train station on one side and the address of the metro station on another side, and are showing a path around the station. In fact the station has entrances on both sides. To go from the trains to the metro, you won't go outside, you'll go through corridors and down some stairs.